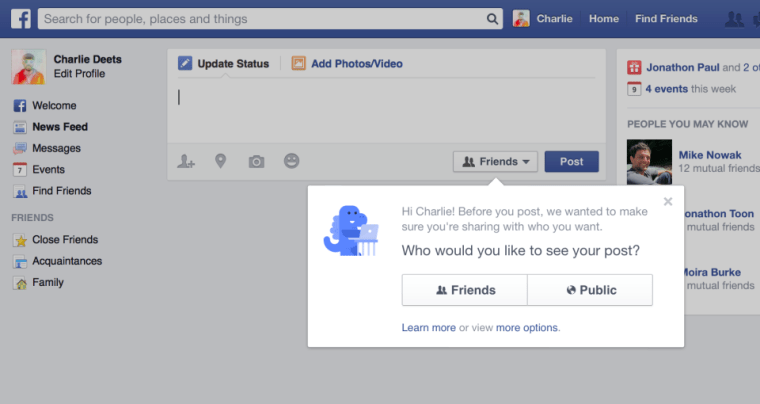 Facebook wants to make it harder to overshare with new default settings and a privacy checkup tool. Before, it was the other way around, something that caused privacy concerns because new users might not understand that “Public” meant that people outside of their social circle could see their photos and status updates. That should make it easier for Facebook newbies to avoid sharing vacation photos with people they don’t know. But even longtime Facebook users can get confused over what exactly they are sharing. For them, Facebook is releasing a new “privacy checkup tool” that will take users through who is seeing their posts, what apps they are using, and what private information they might be sharing on their profile. How to balance features that encourage sharing — like its new "Ask" button and its Shazam-style tool for identifying and sharing TV and music choices — and privacy will almost certainly be on the agenda today as Facebook talks with shareholders about whether they "Like" the direction the company is heading.